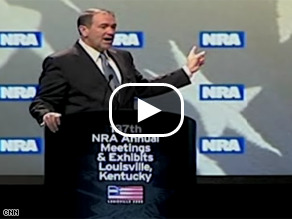 Watch Huckabee's joke at the NRA Convention Friday. (starting at 0:50). (CNN) - Former Republican presidential candidate Mike Huckabee, known for his razor-sharp humor on the campaign trail, has again found it can be a double-edge sword, as he spent a third day explaining his admittedly “awkward” quip about Senator Barack Obama. Huckabee talked to reporters Saturday after addressing graduates at Patrick Henry College in Purcellville, Virginia. Not surprisingly, the first question was about Friday’s joke at the NRA Convention in Louisville, Kentucky, about the Democratic presidential front-runner. It came up again Sunday in his appearance on “Meet the Press”. After a loud noise back stage during his speech Friday, Huckabee joked, “That was Barack Obama. He just tripped off a chair. He’s getting ready to speak and somebody aimed a gun at him, and he dove for the floor.” The audience, who laughed as he started the line, turned quiet. That was not a Racist comment. It was a comment about a competitor. These guys need bodyguards round the clock anyway. Why puck every comment out as Racist!. God made different species and races. They are naturally leary of each other as an instinctive thing. Tribes have been waring since creation because someone who looked a little different from your own could be a threat. So poo on the word Racist that is just an excuse for troublemaking. God made us all and when we are face to face, prove you are good and trustworthy. Then I don't care if you are pink or turquoise. Also, McCain too old? If 60 is the new 40 then 71 is the new 51. Maybe he will live to be 109.. I wouldn't take the joke personally and I think Obama is of the sameopinion. It's just that to throw such a joke under the current sircumstances is pretty lame. Bad tast and especially unexpected from a minister of religion. Remember, an agent of change was actually gunned down – MLK. It saddens me to hear DEMOCRATS say that they will vote for McCain! He does not share the same values as us democrats! I know that may HRC supporters are upset that she is losing, but don't take your anger out on Obama. He has not done anything wrong. They have both campaigned hard and he simply received more votes. He has not stolen anything from HRC nor blocked votes on FL and MI. We have got to unite and and realize who the real enemy is - THE REPUBLICAN PARTY!